This week I interviewed Dr Steven Tsitas of the Satellite Navigation and Positioning Lab and lead author of the paper, “6U CubeSat design for Earth observation with 6.5m GSD, five spectral bands and 14Mbps downlink.” This paper has been peer reviewed, and appears in the November 2010 issue of The Aeronautical Journal which is published by the Royal Aeronautical Society. I analyzed the business potential of such a cubesat constellation in a previous post here. Dr. Steven Tsitas received his BSc(Hons) in Physics from the University of Melbourne, MS in Physics (with Distinction) from California State University Fresno and MS and PhD in Planetary Science with a minor in Astronomy from the California Institute of Technology. His two part PhD thesis title is The effect of volcanic aerosols on ultraviolet radiation in Antarctica and A novel method for enhancing subsurface radar imaging using radar interferometry. After completing his PhD Steven worked as a Management Consultant at Bain & Co. in San Francisco. He recently completed a MSc in Astronautics and Space Engineering at Cranfield University, receiving the Vega Space Systems Engineering Prize for Excellent Performance in Dynamics Related Subjects 2008/2009. His most recent papers detail the system design and commercial applications for an 8 kg, 6U CubeSat that can perform Earth observation missions equivalent to those of current 50-150kg microsatellites, with a corresponding reduction in cost. Q: Your paper posits the potential of a constellation of cubesat earth imaging satellites capable of performing their job on par with current industry leaders like the European company Rapideye. To fit so much capability into a 6U Cubesat is incredibility daunting. What innovations are you proposing to accomplish this? DVB-S2 encoding and a three speed transmitter to allow fast downlink from such a small spacecraft. One of the things that I like about space engineering is you can twist and turn around obstacles to find solutions - it is quite a creative process. However the design process isn't arbitrary, the culture of space engineering is to design to requirements, and if done well every component in the spacecraft can be traced to a top level requirement through a process of step by step logical decisions. Just as a limited palette doesn't limit an artist, this logical discipline doesn't have to limit creativity in the design of spacecraft. Q. RapidEye produces images in five spectral bands including infrared – does your proposed 6U system do the same? Steven Tsitas: Yes, it images in the same 5 spectral bands as RapidEye. Q. RapidEye produces a 6.5-meter resolution image – what resolution image does your proposed 6U system produce? Steven Tsitas: 6.5 m Ground Sample Distance (GSD), the same as RapidEye. Q. RapidEye admits their 6.5-meter resolution is not adequate for some commodity customers like those tracking crops like grapes, strawberries, and peanuts. What is the highest resolution (better than 5-meter?) that you believe possible today in a 6U? Steven Tsitas: Good images aren't just about resolution, but also having good contrast at medium spatial frequencies. This is quantified by the Modulation Transfer Function. I've seen a high resolution image with poor contrast at medium spatial frequencies, and it looked much worse than an image of the same scene with lower resolution but higher MTF at mid spatial frequencies. I could improve the GSD of the 6U CubeSat design at the expense of contrast, but this wouldn't necessarily give better or more useful images. Fundamentally resolution is limited by aperture size, and the 6U CubeSat design has an 89 mm aperture imager. Given the 6U CubeSat is just 100 mm thick this is obviously close to the limit. Short of some kind of foldable optics or deployable membrane mirror technology I don't think you are going to do much better than that with 6U. Q. RapidEye’s satellites are designed to last seven years – your research indicates a 12 year satellite life per 6U. How would the orbital life of each satellite change by offering the RapidEye service of a photo anywhere on earth within 24 hours? Steven Tsitas: To be clear, the paper indicates that the orbital lifetime could be 12 years, and in fact could exceed 25 years requiring a deorbit device, for which provision is made in the design. The orbital lifetime is not necessarily the same as the operational lifetime. Regarding the effect of imaging operations on operational lifetime, the 6U CubeSat design does not include propulsion or any consumables, so there is no direct link between a particular imaging campaign and the operational lifetime of the spacecraft. Q. In a recent post, I speculate on the economics of a such a 6U cubesat constellation. What further are you planning in this area? 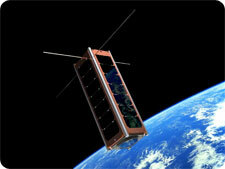 Steven Tsitas: I discuss the commercial implications of the 6U CubeSat design in an upcoming paper. Standby. Perhaps we can continue this conversation after the release of the new paper. Thank you Steven. Yes, let’s talk again with the release of your paper on the economics of such a cubesat system.